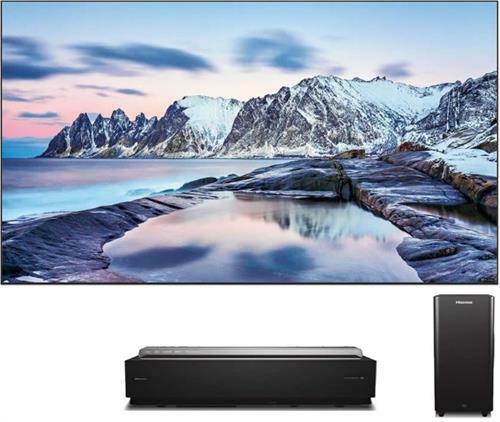 It is more than just a TV .With a massive 100 inch screen and incredible laser technology, 4k Ultra HD resolution and 4K up scaling, The Hisense UHD 4K laser TV with DLP technology gives you super smooth, clear images in fast action scenes and sports that delivers the most stunning cinematic experience and incredible picture quality in any room of your home - day or night. With a special large 4K display , it time to sit back and relax as your home becomes an amazing movie theatre .So be immersed beyond your imagination. The Hisense 4k 100 inch Laser TV delivered the finest detail and brightness as seen in cinemas. Connect wirelessly with the Dual band WiFi and Bluetooth audio to stream your favourite content with the host of built-in apps and the web browser to bring your home theatre to the next level in one sleek beautiful package. The Hisense Laser TV’s thin, lightweight, 100" screen hangs wirelessly, inconspicuously—elegantly. It doesn’t require a specially darkened environment or messy equipment. The Hisense Laser TV will make you see your walls in a whole new light. Enjoy any video content like the movies , concerts and more . With the Hisense 4K laser TV technology life is re-imagined with bigger , better and shaper more amazing natural colours and contrasts . In short, it makes all other TVs look like prima donnas. Gorgeous. Versatile and unapologetically amazing. It’s time to rethink TV, and for that matter, your walls. The 100" 4k Ultra HD smart laser TV explodes with colour and gorgeous 4K resolution. Where giant LED screens have ugly, intrusive installation, the Hisense Laser TV’s thin, lightweight, 100" screen hangs wirelessly, inconspicuously—elegantly. It doesn’t require a specially darkened environment or messy equipment. The Hisense Laser TV will make you see your walls in a whole new light. With incredible laser technology, 4k Ultra HD resolution and 4K up scaling, the Hisense Laser TV is the TV you’ve been waiting for. With WIFI and tons of built-in apps, and the Hisense Laser TV is unapologetically amazing at an unbeatable value. In short, it makes all other TVs look like prima donnas.